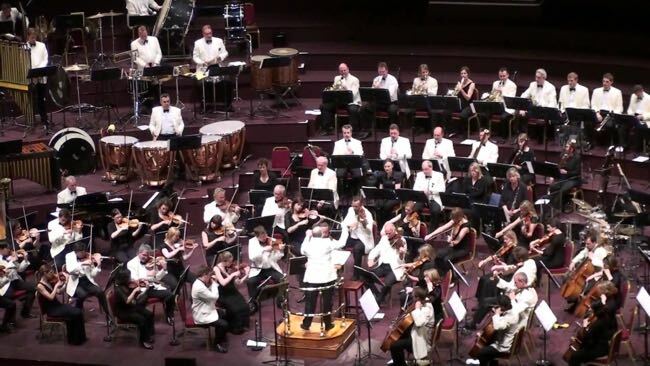 The Royal Philharmonic Orchestra’s annual Filmharmonic concert at the Royal Albert Hall on Friday night kept a large crowd of film music enthusiasts entertained with scores by top composers including John Williams, Maurice Jarre, John Barry, Lalo Schifrin, Howard Shore and Hans Zimmer. Paul Bateman conducted the rest of a two-hour show with presenter Tommy Pearson providing useful context and witty banter between sets. Pearson also introduced the two guest composers who looked very pleased to be there. Arnold drew a huge laugh when he mentioned that in “Stepford Wives” Nicole Kidman was remade as a robot “as if you’d notice”. The regular James Bond film composer paid tribute to his mentor Barry, the 007 original, and his music showed how skilfully he is filling the master’s shoes. There were also excellent arrangements by Mike Townsend of Ray Parker Jr.’s “Ghostbusters” and four main themes from American television shows of the 1980s: “Dynasty” and “Cagney and Lacey” by Bill Conti, “L.A. Law” by Mike Post, and “Dallas” by Jerrold Immel. Listening to those catchy tunes took me back to many days spent on the sets of each of those shows when I was reporting for TV Guide Canada. Good times they were: Lunch with Joan Collins at the 20th Century Fox commissary and at La Scala in Beverly Hills with Linda Evans, who used numerology to predict my fortune. This entry was posted in Film, Memory Lane, Music, Notes and tagged David Arnold, Debbie Wiseman, Filmharmonic, Joan Collins, Linda Evans, Linda Gray, Paul Bateman, Royal Philharmonic Orchestra, Sharon Gless, The Royal Albert Hall, Tommy Pearson. Bookmark the permalink.